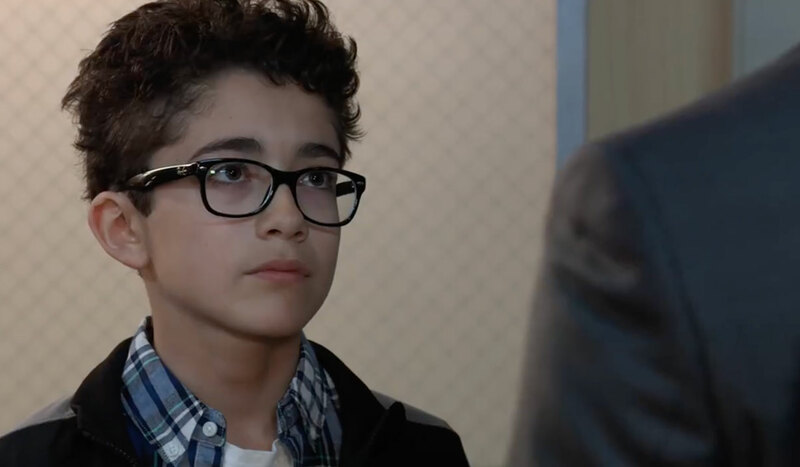 Friday, April 12, 2019: On General Hospital today, the charges against Kevin are dropped, Jordan worries about Ava's actions, Sasha speaks to Nina on Maxie's behalf, and Valentin warns Spencer the truth always comes out. Laura dragged Spencer to the hospital for a board meeting. After it’s over, he takes off to look for Lucy or Epiphany to pitch some ideas for the Nurses’ Ball. In his office, Laura catches Finn practicing his proposal to Anna. She asks Finn for his expertise if Ryan could be alive given the authorities determined his hand was severed while he was still alive. Finn explains if Ryan was able to get the wound taken care of in time then he could have survived. She thanks him for his input, and says she couldn’t help but notice him practicing a big question. He asks Laura’s opinion on the ring he purchased, which she thinks Anna will love. Meanwhile, Spencer runs into Valentin, and he asks his uncle if Nina has figured out he and Sasha are up to something. Valentin warns him that Charlotte told him all about the rigged election, and warns he could make anonymous tip to the FBI if Spencer tries to make trouble for his family. Laura finds Spencer with Valentin and warns Valentin he is not to go near Spencer. She is glad she ran into him because they need to set a schedule for Charlotte. Valentin tells her that she is not on the custody order, so he doesn’t have to let her use Lulu’s court appointed time to see Charlotte. Sasha meets Maxie and Peter at Charlie’s, who apologize for running the DNA test on her and calling her integrity into question. Sasha insists they need not apologize anymore and move on. Maxie hopes one day Nina will share her sentiments. Curtis stops into Crimson to see Nina and asks if she’s been able to find a kidney for Jordan, but her connections haven’t turned up a match yet. Curtis switches the topic and asks if she has any work for him. She doesn’t, but tells him about Maxie and Peter’s DNA test, and that Maxie thinks something is going on between Valentin and Obrecht. At her home, Anna has Robert over for tea and to catch up. She brings up their first mission together and Robert realizes she’s fishing and scared. She cries, “What if it wasn’t me on that first mission but Alex, and she’s Robin’s mother.” Robert refuses to believe that was Alex on the mission, but she tells him he can’t prove it wasn’t her because they are identical twins. Anna believes Alex had Robin and she had Dr. Cabbott give her the memories to believe Robin was her daughter. Robert thinks she is punishing herself for the guilt of being a double agent, and he won’t let her punish him and Robin in the process. Finn arrives to find Robert warning Anna she’s going down a rabbit hole. Finn agrees with Robert, but acknowledges Anna’s theory is possible. Anna can’t live with this uncertainty and has to find the truth out. Robert thinks he knows the truth and won’t watch her do this. In the halls of the courthouse, Ava overhears Margaux telling Jordan to move on because the Chamberlain case is closed. Margaux heads into court, and Ava confronts Jordan over doing nothing to find Ryan. Jordan realizes Ava is planning something, and warns her not to do anything foolish. Ava storms off, and Jordan calls Julian to discuss his sister. 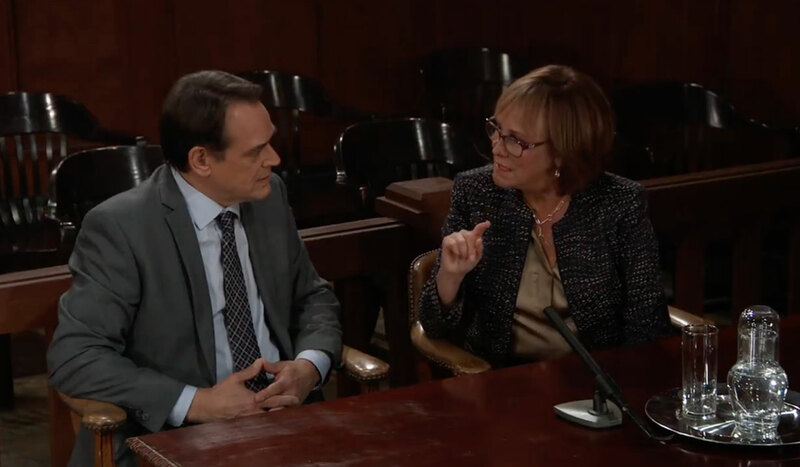 In court, Nora tells Kevin that she asked for a meeting today to avoid a trial. Margaux and the judge enter, and Nora asks for the charges against her client be dropped. Margaux objects because Kevin already admitted to hiding his brother from the authorities, but Nora explains Kevin can’t be found guilty of harboring a fugitive because Ryan was a dead man at the time. Margaux believes Kevin had a moral obligation to report his brother, but Nora points out the court doesn’t legislate morality. The judge agrees with Nora and rules the charges against Kevin be dropped. At Crimson, Maxie gives Nina the documents she asked for, and she apologizes again for what she did. Nina doesn’t want to discuss it. Sasha enters and asks Nina to please consider her apology. She says Maxie is Nina’s family, and that makes Maxie her family too, and she’s forgiven Maxie. Nina forgives Maxie and they hug. Peter runs into Valentin outside of Crimson. He apologizes for doubting his intentions with Nina. Valentin gets a call and excuses himself. Inside, Ava orders a drink and someone spies on her through the window. Valentin heads to the courthouse and runs into Nora. Kevin returns to the hospital and runs into Spencer and Laura. Laura asks Spencer to give them a moment, so he leaves. Kevin tells Laura the good news, and he’s going to appeal the hospital’s decision to suspend him. Laura tells Kevin about her discussion with Finn, and Kevin agrees they can’t be certain Ryan is gone. Spencer tells Nina that Valentin is blackmailing him. Willow calls someone to talk.